The Welsh Rugby Union would let Warren Gatland miss the 2013 Six Nations if the Wales boss is chosen as British and Irish Lions coach for their 2013 Tour. The 48-year-old New Zealander inspired Wales to a second Grand Slam in his tenure and he wants to lead the Lions in Australia in the summer of 2013. Lions bosses want their 2013 coach to be "available effectively a year out." 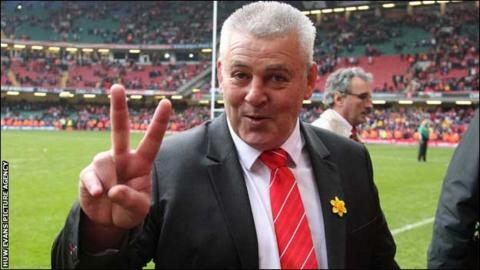 The WRU would ask Gatland's assistants Rob Howley and Robin McBryde to lead Wales in 2013 if Gatland is Lions boss. "He has not got a break clause in his contract," revealed WRU chief executive Roger Lewis. "But I really want Warren to coach the Lions in 2013 and he and I have discussed it. "What I proposed to the board of the Welsh Rugby Union before the Six Nations kicked off is that, if Warren is approached to coach the Lions, that we should support him - and I'm pleased to say that they endorsed that unanimously. "I'm comfortable that it is right for Warren to step back from next year's Six Nations for two reasons. "One as it allows him the chance to look at what is taking place in the rest of the home nations. "But also it allows us to plan our succession during 2013 when we could well lose Warren after the World Cup in 2015. I think that is a fair deal. "The likes of Rob and Robin and people like that will be focused on the Six Nations in 2013. "I'm confident we can do what is required and most importantly we all want to build our other boys while he is away to plan our succession really cleverly post-2015." The WRU fear that Gatland, who guided Wales to fourth at the 2011 World Cup, could leave once his current Wales contract expires and their succession plan is seemingly Howley and McBryde to step up following the 2015 World Cup in England. Lewis has also admitted he had spoken "informally" to Lions team manager Andy Irvine and Lions chief executive John Feehan about the prospect of Gatland, who was assistant to Sir Ian McGeechan on the 2009 Lions tour in South Africa, coaching the British and Irish team. Gatland, who also won the 2004 Heineken Cup and three English Premiership titles as coach of London Wasps, is favourite to become the second foreign coach to lead the Lions as fellow Kiwi Graham Henry, who was also Wales coach, took the unsuccessful 2001 tour to Australia. Lewis told BBC Sport: "Warren has worked in provincial rugby in Ireland, he coached Ireland at national level, he then came into Wasps in English rugby and what he created was something so special. "So in terms of that Irish, English and Welsh perspective I think you have someone pretty unique there." Wales lost their coaching team of Gatland, assistant Shaun Edwards, skills coach Rob Howley plus other members of their backroom staff to the 2009 Lions tour to South Africa - a tour they lost 2-1 to the world champions - when Wales were on a two-Test tour in North America. The Welsh are to tour Japan in the summer of 2013 and Lewis feels Wales can manage the Far East trip "smartly even though most of our boys will be in Australia." See Wales' Grand Slam 2012 on BBC Two Wales at 1900 GMT on Wednesday, 21 March.